Our survey showed that 36% of people who applied for SSI were approved, but the chances of getting benefits were higher at hearings. If you have a disability or a serious medical condition that gets in the way of earning a living, you may be thinking of applying for Supplemental Security Income (SSI) benefits. What are your chances of getting SSI? And what can you do to improve those chances? To help answer these questions, we surveyed readers around the country who recently went through the SSI application process. Here’s what we learned. Overall, only a little over a third (36%) of our readers who applied for SSI were ultimately approved for benefits. No doubt, that sounds discouraging. But it may help to understand more about how the process works and when approval rates go up. First, a bit of background on SSI and the approval procedure: SSI pays a small benefit to people who are disabled and have little or no income or assets. In contrast to Social Security Disability Insurance (SSDI), you may be eligible for SSI no matter how little you’ve worked in the past. After you file an application, the Social Security Administration (SSA) will first decide whether you meet the financial eligibility requirements for SSI. If you pass that step, a disability examiner will look at the medical evidence and approve your claim if you meet the medical eligibility requirements for disability benefits. Only one in five (20%) of our readers successfully made it through these initial financial and medical steps. Government statistics from 2017 show that 23% of initial SSI applications were denied because they didn't meet the financial requirements; that results in an initial approval rate of 41% based only on medical eligibility—considerably higher than for all SSI applications. Second, a denial at this initial application isn’t necessarily the end of the process. Applicants can appeal a denial by requesting a hearing before an administrative law judge. (Most states require them to go through a reconsideration review first.) 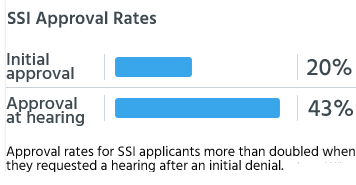 Once our readers got to the hearing stage, their chances of success more than doubled; more than four in ten (43%) of SSI applicants were approved for benefits after a hearing. Despite that huge improvement, less than half (47%) of those who were initially denied actually requested a hearing. That’s a shame, because those who give up or miss the deadline for filing an appeal pass up their best opportunity to receive benefits. Another survey result showed an even more striking difference than the approval rates at the application and hearing stages. 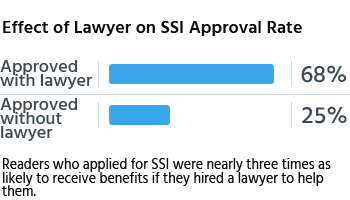 Readers who hired an attorney at some point in the process (usually for the hearing) were 2.7 times more likely to receive SSI benefits as those who proceeded without a lawyer (68% compared to 25%). It may also help to know that you won’t pay a disability lawyer anything unless and until you win benefits. Social Security disability lawyers receive a percentage of the past-due benefits (or backpay), up to 25% of the award or $6,000, whichever is less. But they usually receive less than the $6,000 maximum. Our readers told us their SSI lawyers received an average of $2,900 from their SSI backpay. Our survey showed that concurrent applications had poorer outcomes than other claims. Only 15% of readers who filed for both programs were approved at the initial application stage, while the approval rate more than doubled (to 36%) at the hearing stage. That’s still lower than SSI-only applications and considerably below SSDI-only approval rates (30% at the application level and 55% after a hearing). Why the lower approval rate for concurrent applications? People who apply qualify for benefits from both programs tend to be younger and are more likely to apply when the labor market is poor. This means that concurrent applicants are more likely to be only marginally qualified for disability benefits. And according to a report from Social Security, concurrent applicants are more likely to file for mental conditions (like depression) and musculoskeletal conditions (like back pain) than SSDI-only applicants; these conditions have relatively low rates of approval. Finally, compared to those who apply for only SSDI, concurrent applicants face many of the same obstacles that apply to SSI-only applicants (more on that below). History of work. Many SSI applicants haven’t worked much over the years. Even though this program doesn’t have SSDI’s work-history requirements, Social Security claims examiners and judges are less likely to believe that your disability is what’s preventing you from working if they don’t see evidence that you’ve at least tried to work. Doctor visits. SSI applicants may also have had problems seeing a doctor because they don’t have health insurance. Our survey results back up this observation: Although a small percentage of readers hadn’t seen a doctor for their medical condition in the year before they applied, SSI applicants were four times as likely to be in that situation as SSDI applicants (12% compared to 3%). Having a supportive doctor—who has treated you for years and can provide solid documentation on your medical conditions and limitations—can be the most important difference between being approved or denied for disability benefits. Age. SSI applicants and recipients tend to be younger. (According to government statistics on the demographics of disability beneficiaries, the average age of SSDI recipients is 54.5, while the comparable average for SSI recipients is 44.7.) Many medical conditions deteriorate with time and age, so Social Security is more likely to recognize that older applicants are too disabled to work. Gender. A higher proportion of SSI applicants are women—56% of our readers, compared to 49% of SSDI applicants. (Women are less likely to be insured for SSDI because of fewer years of work.) Our survey also showed that all women have somewhat lower approval rates than men (38% versus 44%). In part, this may be related to the fact a higher percentage of women have the kinds of medical claims that are more difficult to get approved. For instance, 65% of readers with depression and other mood disorders were women, while only 34% of those who listed cardiovascular problems were female. Mood disorders have significantly lower approval rates than cardiovascular conditions. "Get a local lawyer for SSI who knows the local legal judges and the local process, before applying."